There can be few, if any, musical achievements as great as Bach's regular composition over several decades of several hundred (probably as many have been lost as now survive) church cantatas – from his second, and much longer, stay at Weimar (1708-1717) and throughout the (earlier) period when Bach was in Leipzig, from 1723. Although he sometimes borrowed from earlier works, a total of five original cycles with cantatas proper to each Sunday in the Lutheran calendar is known once to have existed. Now there are fewer than half of that number in the canon. that by Gardiner on Soli Deo Gloria. 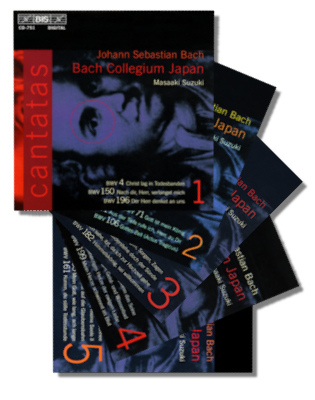 This has attracted much interest because of its unusual circumstances: Gardiner's cycle was conceived as part of the 250th anniversary of Bach's death in 2000; individual cantatas were recorded as part of live performances in a variety of (relevant) locations on the Sundays for which they were written; then the label on which the CDs were eventually released (SDG) was effectively launched by Gardiner after Deutsche Grammophon pulled out of the ambitious project. The fourth cycle is now only just over an estimated year from completion. It's on BIS and has every bit as much to recommend it as does each of the other three. In one respect it has more – the quality of its audio. Volumes 1-27 were released as conventional Compact Discs. Then from volume 28 all releases have been SACD Hybrid (SACD Surround/SACD Stereo/CD Stereo) discs. This is something from which Bach's beautiful and profound music truly benefits, as it does from the playing of soloists and the Bach Collegium Japan under Masaaki Suzuki. The entire cantata cycle is also available in even higher-quality (16- and 24-bit FLAC) formats from the eClassical.com website… it was in that format, in fact, that BIS generously made all 50 volumes released so far available for this review. (The cycle is expected to stretch to 55 volumes, the last one of which is likely to be released at the end of next year.) The experience was a totally positive one – fast download times (even when attempting multiple simultaneous downloads); not one dropped session; PDFs of the supporting material arranged logically; clear links, indexes and web page layout etc; straightforward and clearly thought-out membership management; the concept is a good one that worked flawlessly during a lengthy evaluation period. Still, all the audio quality in the world couldn't make up for sub standard performances. Prospective buyers of all or part of the BIS cycle need have no fears in that respect. The music-making is excellent, appropriate to our current understanding of performance practices, penetrating, perceptive, engaging and highly enjoyable. For all the "snappier" feel to Suzuki's style of Bach playing (tempi tend to be on the quick side – especially when compared with Rilling's; though never hurried), nothing is missing. What's more, Suzuki has great control of the music, its expressive power and the way in which performers should bring as much as possible out of its entire corpus. He starts out fully aware of its many nuances and shades of meaning and depth. This is so clear and impressive that it's tempting to think that Suzuki uses variety almost as an end in itself. Indeed, the cantatas have a wealth of musical flavors and feelings, from the extrovert full orchestral textures to the declamatory duet to the intimate aria. From reflection and rumination to assertion and exclamation. This richness is one of the aspects of Bach's cantatas that sets them apart from the less distinguished largely chorale-based models on which Bach was expanding. So for Suzuki to use precision and color, clarity and insight to such effect is quite appropriate. Listen to the way the opening chorus (after the Sinfonia) in Ich hatte viel Bekümmernis (BWV 21) [CD.12, tr.12] adapts to the text, achieves pace, pathos and penetration; yet without ever noticeably "speeding up" or "slowing down". There is interest, rather than excitement. Engagement rather than surprise. Sustained involvement rather than peaks and troughs. Yet the qualities of each movement stand out. Like the vast majority of the performances throughout, they simply convey the essence of what Bach must have intended – without self-consciousness. Indeed, the Japanese conductor, who studied harpsichord and organ with Ton Koopman has as much of a broad conceptual goal in presenting this extraordinary and extraordinarily-beautiful music as does Gardiner in his "pilgrimage". Yet it's a goal that's more implicit, perhaps, than those stated by Koopman or Gardiner. While it could be argued that Gardiner emphasizes the universality and integrity of the cycle as a whole, Suzuki is at pains to highlight each cantata's own individual musicality, its character, its uniqueness, its particularity. Again, in BWV 21, the soprano aria of the next movement curves, twists, weaves the emotion. Yet never slows to indulge what we, as listeners, would think of as sadness. The plain music first and foremost. Affect without effect. Other attributes that more precisely define the tone of this cycle are not merely a high-spiritedness, but a sense of spirit in broader terms: the performances are full of energy. And at the same time spiritually rich. Depth is never lacking. If there were a meridian, and if Rilling's slightly slower and romantic readings (See the review of Hänssler 98630, for example) almost meet Koopman's steadiness and force on one side, then Suzuki goes beyond Gardiner's brightness on the other. At the same time, suaveness, fluidity – indeed a purposeful flow and adherence to each cantata's architecture and inner logic – are never sacrificed for a shallower projection of any of the cantatas. Still less – ever – for effect. At times it is as though the singers are encountering the music for the first time. They're not, of course. But their articulation is fresh and full of heart. Looking at a cantata performance which epitomizes Suzuki's approach, BWV64, Sehet, welch ein Liebe hat uns der Vater erzeigt [CD.13, tr.s 1-8], we hear a distinction in scope between the splendid opening chorus and the more sober yet none the less stimulating chorale. Each of these has a restrained yet ample and full complement of the singers from the Bach Collegium Japan singers and instrumentalists. But the filigree, the pointed intertwining melodic lines, are every bit as precise and directed in the soprano aria which follows with Yukari Nonoshita gently leading us through the brief and distilled words. As contrast Peter Kooij's bass recitative has enunciation that's as clear and resonant as any to be found on any of the four cycles examined on Classical Net. It's not that he makes more of his delivery than the text bears. But that what he puts behind that text opens it to our examination to just the right degree. Robin Blaze's alto aria, "Von der Welt verlang ich", follows with a freshness and enthusiasm that infect all Suzuki's cantata performances. They seem to reflect nicely what may well have been part of Bach's need to produce cantatas regularly week in week out for several years. This greater awareness on the part of Suzuki and his forces makes for a consequent groundedness in the confessional orthodoxies of the time. And the spark of genius that Bach could never have disguised. In this case, it's the admirable tension that Suzuki evokes between the oboe and Blaze's adamantine voice. Yet without artifice, contrivance or strain. All we need is the beautiful closing chorale to wish us Good Night, which it does without a second's superfluous emotion; yet with maximum impact. It's a well-known tune and needs to be presented to us afresh. This Suzuki does by steadiness of tempo and sure-handed phrasing. Suzuki has a gift throughout the cycle of bringing new dimensions, shining new light and approaching from a new (though not a novel) angle, music which is often very familiar to us. Freshness and impact are hallmarks of this cycle as are the technical and interpretative strengths of Suzuki and his players and singers. Other cantatas could be analyzed in similar fashion. Each one would be found to contain something not startling but striking. Yet the essence of Bach's liturgical purpose is never obscured – however dramatic, stark, laden with raw emotion or gilded in quiet achievement they are. Suzuki clearly draws upon his knowledge of the background to Bach's time and work in appearing to offer us cantatas one after the other yet each more special than the last. Recordings for the cycle began in 1995, with the Bach Collegium Japan (orchestra and choir) founded five years earlier by Suzuki. Considered Japan's leading period instrument performers, the cycle of recordings has been made in the Shoin Women's University Chapel in Kobe, Japan. Suzuki uses 40 singers in all over the 50 volumes released so far. The standard is uniformly high. As is that of the period instruments, which add immeasurably to the impact of the music. Remember, too, that this is the only dedicated such cycle that uses period instruments and forces which, many argue, approximate to those for which Bach wrote and to which he was used. For many, this will be the defining attribute of the cycle. If you demand a wholly "historically informed" approach, this probably comes closest. (Which is not to doubt or minimize the scholarship, especially, of Koopman and Gardiner.) Certainly Rilling's is more romantic. Koopman's a sparer and more distilled a cycle. Gardiner's privileges élan and veneer. Suzuki's variety and penetrative depth. It's encouraging – and no surprise – that in January 2012 it was announced that Suzuki won this year's Royal Academy of Music Bach Prize. To undertake such a huge stretch of relatively large-scale choral works and complete distinguished and distinctly precise and persuasive interpretations thereof is an amazing achievement. The sound quality of these recordings is undoubtedly the most satisfactory – further, the most stimulating and exciting – of that of the four cycles mentioned. It's the only one available on at least SACD. This reflects a lively, responsive, generous and supportive acoustic in all the recordings. The booklets (or PDFs) that come with each are informative, attractively produced and make good accompanying resources. Indeed, the presentation of the series – digitally or as physical media/products – is uniformly high. While not carrying the extra publishing weight of Gardiner's bound cases, diary and visual appeal, BIS keeps to its own high standards throughout with nothing distracting, but nothing missing. For many, Suzuki's will be the Bach cantata cycle of choice. For everyone it must be considered very seriously and under no circumstances overlooked. For sure, it occupies more media than the others (the average (SA)CD or download contains four cantatas); and it's as yet unfinished. There have been a few volumes in the earlier part of the cycle which were received less than enthusiastically. Complete and uniform faultlessness is nigh impossible. But settle on Suzuki and you will not be disappointed.